If you want something badly enough, sometimes you can make it happen. Twice. On a Bank Holiday Saturday last May, Peckham Square was alive with the marvellous sight of dogs dressed up. Inspired by Macey’s Pet-Acular, the annual Easter bonnet parade for dogs in New York, Rachael House organised Peckham Pet-Tastic, South London’s first ever fancy dress picnic for dogs. Beautiful Peckham Square was host to dog lovers from far and wide. They congregated to hang out, chat, show off their dogs and their creativity, take photos and be part of the spectacle. Of course, once was never going to be enough. Peckham Pet-Tastic 2 will have more dogs, more bunting, and be even more glamorous than before, a celebration of our relationships with our pets, with each other and with Peckham. So, once more, you are invited to dress up your dog, clip on it’s lead, and bring it along to the canine art social event of the year, Peckham Pet-Tastic 2. Peckham Pet-Tastic 2- so good we made it twice. 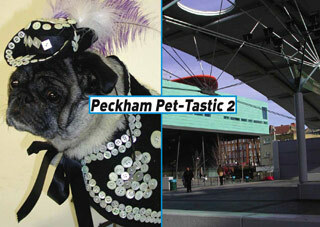 Peckham Pet-Tastic 2 is a Space Station Sixty-Five satellite event. Rachael House has previously made live art events at Duckie, The Centre of Attention and Howl in Belfast amongst others. She is currently in an exhibition at The Lethaby Gallery and is featured in Amy Spencer’s new book ‘The Rise of Lo-Fi Culture’. She is co-director of the artist-run Space Station Sixty-Five in East Dulwich. Rachael has never owned a dog, but has a cat called Misty. Special thanks to Lily the Pug and Cathie and Robin.